Carrie Lannon never imagined the dress she wore to chair the Fashion Group International of Chicago’s 13th annual gala in 1998 would end up displayed in the Chicago History Museum. But, as part of an exhibit titled Chic Chicago: Couture Treasures from the Chicago History Museum, that’s exactly where you’ll fi nd her black backless silk jersey gown. And Lannon’s dress has some prestigious company: It’s displayed alongside Jeanne Lanvin’s Robe de Style, worn by Mrs. Charles S. Dewey when she was presented to the Court of St. James in 1927; the Madeleine Vionnet smoky-gray chiff on Mrs. Potter Palmer II donned to meet the Queen of England in 1938; and 59 other important pieces from the museum’s permanent costume collection, only second in size to the Met’s collection in New York. Fast forward to spring 2008 and Lannon, who is founding co-chair of the Mayor’s Fashion Council, was in a meeting with Timothy Long, CHM’s curator of costumes. “He was looking for recent dresses and asked if I knew anyone who would make a donation,” she says. “I didn’t even think of myself until I learned that none of the women I knew wanted to part with their gowns. I decided it meant more to me to give the Ferragamo a good home in a collection I love than to continue to wear it. ”Lannon found newspaper clips about the gala and a photo of herself in the dress with Massimo Ferragamo. “It was everything I wanted,” says Long, whose criteria in picking pieces for the exhibit was that they be in excellent condition, significant to fashion history and connected to a Chicago woman. That Long even adhered to all of his criteria is a quite a feat, considering the sudden way the exhibition came about. 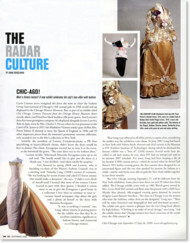 In June 2007, Long had lunch in New York with Valerie Steele, director and chief curator at the Museum at FIT (Fashion Institute of Technology), during which he disclosed his fantasy exhibit was a “best of” CHM couture. Several weeks later she called to ask how serious he was, since FIT had an unexpected void in its autumn 2007 schedule. For years, Long had been keeping a fi le of his favorite CHM couture pieces—which he started when he found Paul Poiret’s 1913 Sorbet evening gown, the fi rst couture dress designed for an uncorseted figure and the one that sparked his passion for fashion as a child—and he and Steele were able to pull the New York exhibit together in just three months. Chic Chicago runs September 27-July 26, 2009. www.chicagohistory.org.